living in the central part of tokyo and being married to a dutchman have made the circle of my friends quite international. despite my nationality, from time to time i feel more comfortable being in a diversified crowd than being surrounded by a homogeneous group of people. there are always great benefits being exposed to different cultures. of course sharing a variety of our culinary cultures is one of them. a while ago, a group of friends got together to teach/learn a typical dish of a country of each one of us. 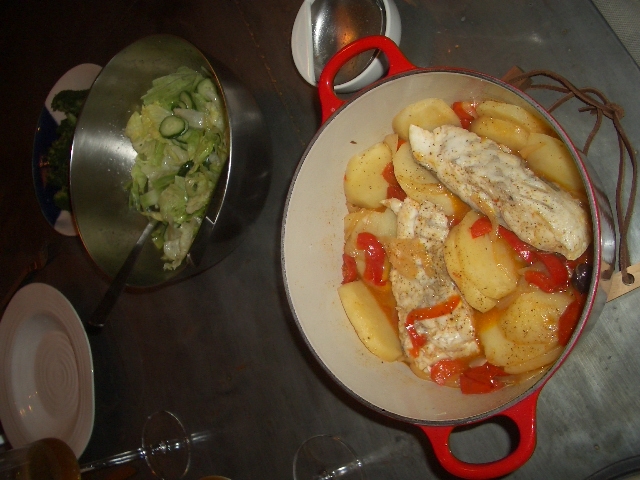 the first lesson was japanese, and at the second lesson i learned this dish, caldeirada de peixe (portuguese fish stew), from our lovely portuguese friend M.
this is the only portuguese dish i can cook. the soup is made with sliced onion, sliced paprika, sliced potatoes, a can of tomatoes (i used a pack of fresh cherry tomatoes this time instead), and a few filets of fish (this time i used snapper, but can be salmon, cod fish, or any other fish of a similar sort), and several pieces of olives (if my memory is correct, i think she put some olives at the end). when M taught us this dish, she used salmon and added some prawns. i think prawns can be replaced with some other seafood, such us scallops or crams or squid. the trick of this dish is the amount of olive oil (a lot) and the time to cook the sliced onion (long). i remember we finished a glass of white wine or maybe 2 glasses of it, while we were waiting for the onion to be ready. you just have to simmer it slowly and slowly, until the onions are very tender and transparent. after 2 glasses, you can pour the paprika, again cook it for a while, and then add tomatoes and simmer again for 5 minutes or so. 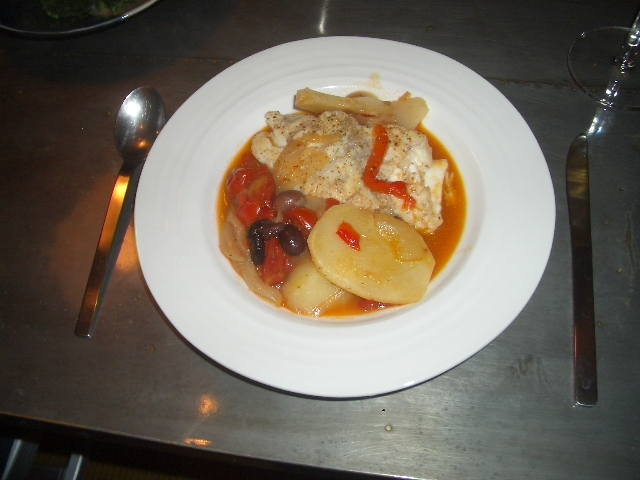 add potato slices, simmer for another 5 – 10 minutes, and finally add the fish, olives and other seafood as you prefer. cook for another 5 – 10 minutes, and add salt & pepper to taste. by the time the dish was ready, we were quite tipsy, chatty and very happy. one day i would love to visit portugal and try this dish in its home country. when that happens, i know i will be very proud of myself. i didn’t have a good day at work. nothing serious, but it still made me down and took my energy away. the cool air outside with the smell of crisp brownish yellow leaves somehow reminded me of home, my parents home in the outskirts of tokyo where you can still find small vegetable fields beside a train track. all of a sudden i missed it so much. how comforting it was, despite occasional quarrels, disagreements and interferences, i was always protected, accepted and cared for. 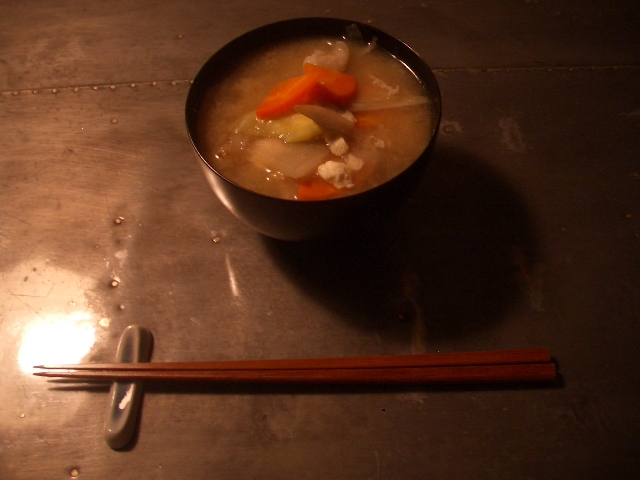 i craved for something my mum had always cooked for us when we were little, my sister and i. once in a while from autumn to winter, she cooked a gigantic pot of 豚汁 (“tonjiru”, miso soup with pork), with a lot of vegetables and some pork meat. my mum grew up in the country side, in a mountain village, with 5 other siblings. the soup was perfect for a big family like that – it is very nutritious and easy to prepare, and most of all it tastes really good, containing the juicy essences from the vegetables inside. it’s basically an upgraded version of miso (soybean paste) soup, with lots and lots of root vegetables, tofu and thinly sliced pork pieces. i actually never learned how to make it from my mum, nor have i got a recipe from her. after all it’s a very simple dish and how to make it is quite self-explanatory if you know how to make other miso soup, so i never bothered to ask her before. the funny thing is though, that the taste comes out to be exactly like hers. in a deep pot, put the water, the root vegetables and bring the water to boil. put naganegi and tofu, pork slices and dashi powder into the pot, again bring to boil. lower the heat, gently remove the layer of residue floating on the surface with a ladle, and simmer for 20 minutes or so. once the root vegetables become soft, put the miso paste in and have it melt by stirring, and simmer for another 5 – 10 minutes. adjust the amount of miso paste to your preference. a bowl of tonjiru gave me an amazing level of security. it’s just miso soup but i felt at ease. i felt the warmth of home, deep inside my stomach. one saturday evening, we had a special couple over for dinner at our home. they are the reason why i met the love of my life, and i hope he feels the same way, and both of us are never be able to thank them enough. cooking my comfort food for them was a tremendous pleasure for me – i reckon that it is quite rare for them to be invited to a japanese house (well, mixed, but close enough), and thought it might be a good idea to go totally local. the dishes i cooked for this special evening were very ordinary japanese home cooked meals. the main course was しいたけの肉詰め甘酢あんかけ (shiitake no niku zume amazu an-kake, “shiitake mushroom and meat stuffings with sweet sour sauce”). this time i used minced chicken with chopped ginger, leek and stalk of the mushrooms. the sauce is made with vinegar, soysauce, “mirin” sauce and katakuri powder (starch) to give it a thickness. and in any japanese course menu, there is always a 〆の一品 (shime no hitoshina “a dish to top it off”) with some carbohydrates. for this occasion i made 刺身タルタル丼 (sashimi tartar don), with ikura (salmon egg roe which look like orange pearls), to make the dish more luxurious than usual. for a dessert, we had M’s famous chocolate mousse – she does the best chocolate mousse in the whole world – that they brought especially for this occasion (my husband dies for this chocolate mousse). no 3-star restaurant can beat a home cooked dinner with friends & family like this one tonight, and our thanks go to M & G.